Do you need more fibre in your life but you don’t want to down some nasty pill or drink a powder? 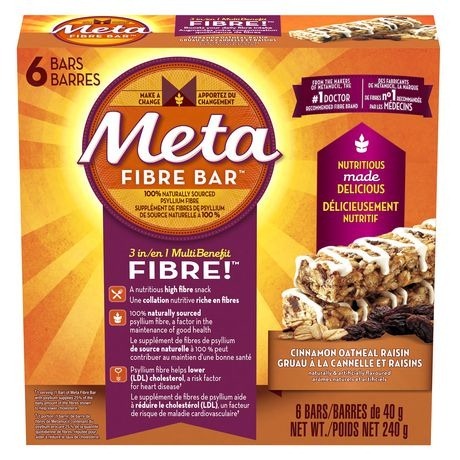 Meta Fibre Bars are DELICIOUS bars that contains lots of fibre to make your regular. I’m not just saying they are delicious, I got to try some. I was hesitant. I thought for sure they wouldn’t be as good as they claimed to be but I was pleasantly surprised. I was actually audibly sounding my pleasure with Mmmmms. Currently coming in Cranberry Lemon Drizzle and Cinnamon Oatmeal Raisin I have to say that the cinnamon was my favourite. They both tasted great though. The first tasted refreshing because of the lemon while the second was very homey and comforting because of the cinnamon/raisin. What do Fibre bars do? Important: You must eat a bar with at least 8oz of water or another liquid in order to make sure the fibre doesn’t constipate you. This is true of any kind of fibre. The Meta Fibre Bars come in boxes with 6 bars. Pick up a box for a quick way to boost your fibre intake without sacrificing taste.